I recently added an admin settings page to allow the user to select colors for node title labels. 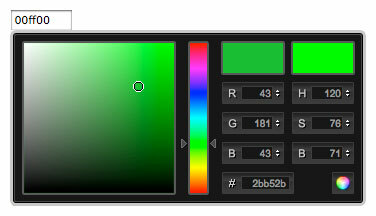 I quick Google search and I discovered this promising jQuery color picker library. Here’s how I embedded it in a form. First I unpacked the colorpicker.zip file and moved it into my theme folder. Next I added a form callback function in my module. Now my form has a text input that uses a fancy color picker to choose the hex value. More documentation on the color picker can he found here.